Growing up in Uvalde, Texas I often saw the green caca colored vehicles that carried the Border Patrol emblems on the doors. The men inside almost always wore cowboy hats and aviator style sunglasses. Sometimes I would see them driving really slow along the farm-to-market roads, looking out into the monte (brush). Whenever the zopilotes (buzzards) were circling above, it was inevitable Border Patrol agents were coming into the area. I knew what had happened. When my family and I would drive to Piedras Negras, or “P’al otro lado” as my Uncle Lito often referred to it, I saw what I thought were the same men in uniform. On the way back over the bridge, they would motion cars forward, check the cajuelas (trunks) and ask people the same question, “Are you a United States citizen?” When it was our turn, in our less than perfect English, all of us in the car would answer in unison, “Yes!” and smile wide. I didn’t know if the Border Patrol agents were different from the Customs agents who worked only the bridges, para mi todos eran igual. My next contact with the men in green was in the summer of 1969. I had gone up North to work in the sugar beet fields of Minnesota and then over to Wisconsin to work at a Del Monte cannery. Oscar Castro, the guy who took us, had worked there the year before so he had all the connections. My friends and I worked the grave yard shift from 10:00pm to 6:00am. We were in the labeling and boxing section and were the last ones to see the cans of vegetables before they were put into boxes for shipping. After we got off work in the morning we usually grabbed something to eat in the company cafeteria or would go gamble with Paul, the guy from Florida who drove the long black 1961 Cadillac limousine. El Paul was always ready to break out the dice. One morning after losing $20 to Paul, I headed back to the barracks. About 10 of us lived in each barrack and over time we got to know everyone and their personal stories. I had gone to sleep when all of a sudden the door burst open and people started yelling. I turned over and saw men in uniforms with guns. En la madre! A couple of them came over to where I was and asked me if I was an American citizen. “Yes”, I answered without smiling wide. Then they asked Oscar, Onofre and Alfred Valverde the same question. They all answered in the affirmative. El Grande quickly began placing clothes and other personal belongings into a small bag. We could tell through the tears that he knew it was over for him. Whatever dreams and hopes kept his spirit alive were being dashed by the reality that he was going to be shipped back to Mexico. By now we were dressed and standing next to our bunks. We watched helplessly as the men from Mexico packed their belongings. But the thing that I remember the most was when El Grande realized he could not fit everything into his small bag and made a gesture offering us a pair of his shoes. I believe it was Oscar who stepped forward to accept them. The look of sadness in his face is one that I can still see today. The men were escorted out of the barracks and we watched as they were loaded into the same green caca colored vehicles we had in Uvalde. Oscar, myself, and the other guys just stared at the ground. We didn’t know what to think or even how to think about what had just took place right before our eyes. It would not be until a few years later when we were in college that the inhumanity of this event would settle into our minds forever. It was 1974, I had just graduated from UC Berkeley. Like most of the students I went to school with, I had gotten accepted to graduate school. But instead of heading down to UCLA, I decided to join Cesar Chavez and the farm workers movement as a labor organizer. A friend of mine was working in the Salinas office of the UFW and I went to visit him. After an interview with a big ugly dude named Roberto Garcia, who was going to be my supervisor, I was hired at the proverbial $5 a week and assigned to the Watsonville Field Office. “Te reportes mañana loco,” Roberto said as we shook hands and I smiled wide. My first day on the job was July 20, 1974. 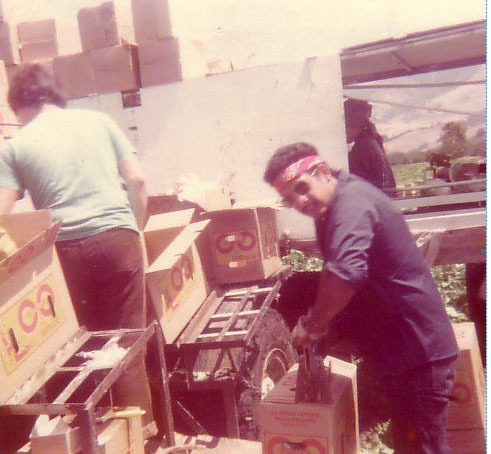 I remember this date because I spent the evening running a machine that printed plastic union identification cards for farm workers under the new UFW/ Pik’d Rite strawberry contract. I must have typed over 100 ID cards that night and was struck by the fact that every worker’s last name was either Fernandez, Rocha or Zamora. I would learn later that a large number of the farm workers in Watsonville were from Gomez Farias, Michoacan, Mexico. I spent the summer getting know the agricultural fields and the labor camps. This was also the summer I discovered carnitas. A pound of carnitas, a package of hot corn tortillas, two or three avocados and a Coca-Cola, and I was set for the best lunch in town. I liked Watsonville. It was in September that I found out how much I really “liked” Watsonville. We got a phone call from Roberto in Salinas telling us we were going to strike the apple growers. Early that year they had signed sweetheart contracts with the Teamsters Union and we were going to show the world that while they might have the contracts, it was the UFW that had the workers. On September 23rd, 1974 at around noon time, we went in a 13 car caravan to the apple orchards of William Buak. Mr. Buak was one of the largest growers in Watsonville. When we arrived we went into the orchards to talk to the workers about living conditions, wages and the new Teamster contract under which they were having to pay dues. We were not surprised to learn that the workers were fed up with what Mr. Buak was doing. You see, we (the UFW) had submarinos (spies) in all the ranches where we were organizing farm workers. We knew almost on a daily basis what was taking place on any given ranch from the inside out. The information our submarinos had provided was accurate, after 20 minutes or so, 37 of the workers took off their apple sacks and joined us in the car caravan as went to other orchards to tell the workers about the strike. By 5:00pm we had signed up 97 Buak apple pickers out of an estimated 125. We ended the day with a big meeting at the union hall in Watsonville. We laid out our strike strategy and elected picket captains. After the meeting was over the workers were given rides back to the labor camps. The next day at 5:30am, we went back to the camps and the workers joined us in setting up picket lines up and down Green Valley Road next to the Buak apple packing plant. What happened next was a sight to behold. At 9:07am, the Immigration Service came rumbling down the road. They had brought two vans, one forty passenger bus and a station wagon. As they approached the picket line everybody froze. We had told the workers that the Migra might show up and if they did, they could not run or break the picket line. As the vehicles got closer and then right in front of everybody, we were pleasantly surprised that everyone held their ground. The Migra drove past the picket line and turned into one of the entrances by the packing plant. I went back to the picket line which was about 100 feet away and saw Mr. Buak and Officer Sill engaged in conversation. Then I saw Mr. Buak lower his head and kick the dirt. I thought to myself, now what was he going to tell Officer Sill, that these apple pickers worked for him and now they were out on strike? Mr. Sill gazed at our picket line for a second or two and then with a simple hand signal motioned to his people that they were leaving. 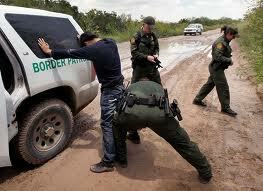 The Border Patrol personnel started their engines and began turning around slowly to leave. After they got down the road, our picket line gave out a big cheer and I gave out a sigh of relief that no one was being taken away. I am sure that for some of the strikers, this was the first time in their lives that they ever gotten that close to a Border Patrol man and remained a free man. My last contact with the Border Patrol. It was now the summer of 1976. I had resigned my position as a labor organizer and was now working in the fields to earn money for school. I didn’t have any scholarships lined up for UCLA, so every penny counted. I was working in la lechuga for the J.R. Norton Company. They used machines to harvest the lettuce. My job was to glue and staple boxes that had been packed with fresh cut lettuce as they came off a conveyor belt. I would then place the boxes in the rows and a truck that was following us would pick up the boxes. One day as I was working, I saw the ladies who were on the machine jump off and start running. Then the machine stopped and more people started running. As I looked around I saw the reason why they were running. The Border Patrol had pulled up to the edge of the field off in the distance and the agents were coming into the field. Some of those who didn’t run tried instead tried to hide. I watched as a few of them crawled inside the lettuce machine. Others tried to hide by covering themselves with boxes. As the Border Patrol started finding people and handcuffing them, the rest of us just watched helplessly. There were maybe eight of us who were American citizens and did not have to worry about being taken away. One of those included a girl name Veronica. All I knew about Veronica was that she was legal and was responsible for three younger brothers and a sister who worked on the machine with her. I don’t know why, but Veronica’s brothers and sisters did not have papers. The Border Patrol found one of them hiding under the front tires of the lettuce machine and ended up catching the others. As Veronica saw her siblings being taken she ran after them but a Border Patrol agent pushed her away. Veronica made her way back to the lettuce machine and was crying non stop. Soon the crying turned to loud sobs and then gasps as she struggled to breath for air. I could see she was hyperventilating. I knew something had to be done. I asked those around me, “Quien tiene un carro? Who has a car? We need to take her to the hospital.” A man named Enrique said he had a van but that he didn’t want to drive it to Salinas. I said I would drive and he went and got the van and brought it into the field. We loaded Veronica in the back and I drove her to the hospital emergency room in Salinas. A couple of her friends came with us. We stayed at the hospital for a couple of hours until they released her. We dropped Veronica off at the house where she was staying and Enrique, who was riding shotgun, dropped me off at UFW office so I could catch a ride back to Watsonville. The next day myself and a couple of others were waiting for the J.R. Norton bus to take us to work but it never came by. I learned later they were still trying to put together a full crew. I couldn’t afford to wait around so the next day I got a job cutting cauliflower with Valley Harvest Distributing and never went back to the lettuce. I never saw Veronica again. I never saw Enrique either. All I know is that while we all have our problems in life, those who have the added burden of being in the United States without authorization live in constant fear, knowing that they are being hunted. It was during the time I was a student that I learned a lot about oppressed people around the world. It was in an economics class where I learned about Adolf Hitler, Nazi Party, and what they did to the Jews in Poland, as well as what they did in Auschwitz. So when I think about what happened to El Grande in Wisconsin and to Veronica’s brothers and sister in Salinas, I fail to see the difference between what the Nazis were doing in World War II and what the Border Patrol does today. However, the real irony is that Mexicans are being rounded up on land that used to be Mexico, so that they can be deported back to modern Mexico.